I briefly sat down with Alex Peters, Propaganda's game director for Pirates of the Caribbean: Armada of the Damned, who stressed the importance of choice in Disney's upcoming action role-playing game. The game is an action RPG on an epic scale. How epic? Alex name checks games like Oblivion, Dragon Age, and Fable, saying that Armada of the Damned definitely fell on that end of the scale, through not quite as action-oriented as Lionhead's game. 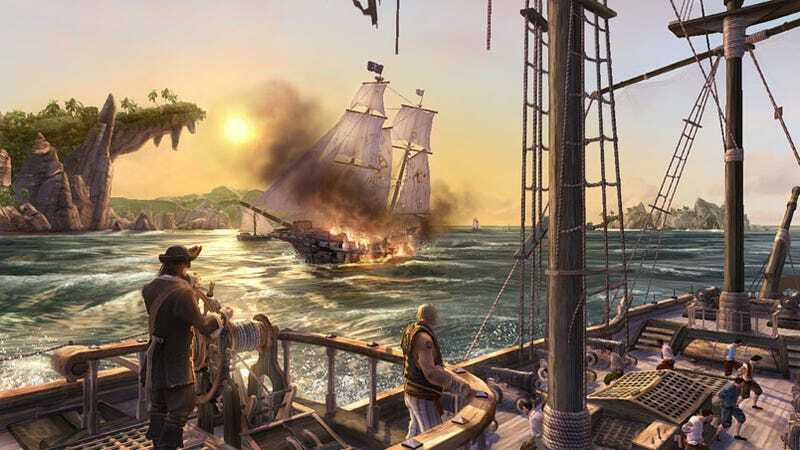 The game of course features a great deal of sea combat as well, allowing the player to sail from island to island, building their crew and taking on other ships in dynamic combat. It all comes down to choices. It's fundamentally about choices. The choices you make and decisions you take change the direction the story is going...the outcome of the story, your character. You can be the pirate you want to be...you can do something else...create your own adventure. It affects the world around you; the economy and the way people react to you. While there wasn't much more to show other than a trailer they've not ready to release and these screens, Propaganda's enthusiasm for the project is certainly heartening. The Pirates of the Caribbean is a very intriguing IP, and with the game set fifteen years before the first movie they won't have to worry about rushing the title to coincide with a movie release. They've still got a good year and a half worth of work ahead of them, so check out the first screenshots, and we'll wait until we see some game play before we condemn the game to Davy Jones' locker.